Have you ever wondered how animals came to St. Martin? One thing is for sure, they didn’t just walk over. Find out how St. Martin went from a lifeless rock to an island full of animals. 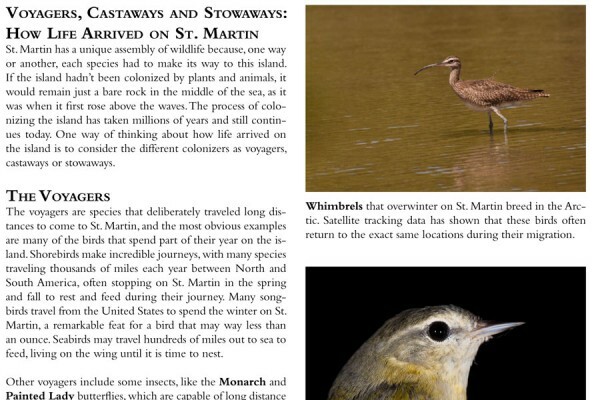 This short paper explains how three different types of animal colonists came to live on St. Martin. 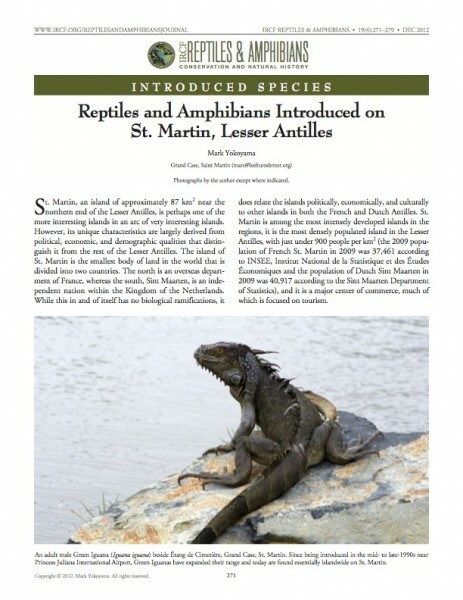 This article about the introduced reptiles and amphibians on St. Martin was published in the December issue of the journal of the International Reptile Conservation Foundation. You can download the article here for free to learn more about this topic. 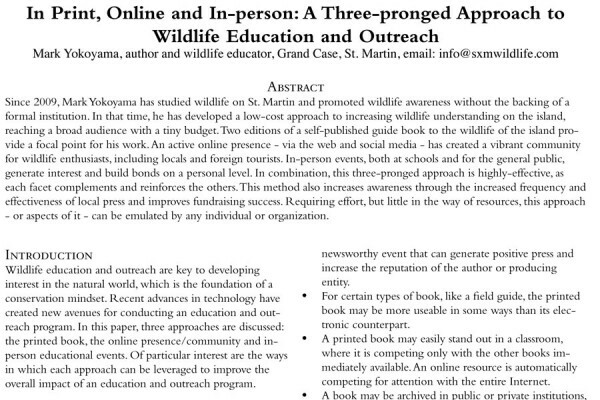 In Print, Online and In-person: A Three-pronged Approach to Wildlife Education and Outreach. Since 2009, Mark Yokoyama has studied wildlife on St. Martin and promoted wildlife awareness without the backing of a formal institution. In that time, he has developed a low-cost approach to increasing wildlife understanding on the island, reaching a broad audience with a tiny budget. Two editions of a self-published guide book to the wildlife of the island provide a focal point for his work. An active online presence – via the web and social media – has created a vibrant community for wildlife enthusiasts, including locals and foreign tourists. In-person events, both at schools and for the general public, generate interest and build bonds on a personal level. In combination, this three-pronged approach is highly-effective, as each facet complements and reinforces the others. This method also increases awareness through the increased frequency and effectiveness of local press and improves fundraising success. Requiring effort, but little in the way of resources, this approach – or aspects of it – can be emulated by any individual or organization. Download the PowerPoint presentation (view notes to see the material presented). 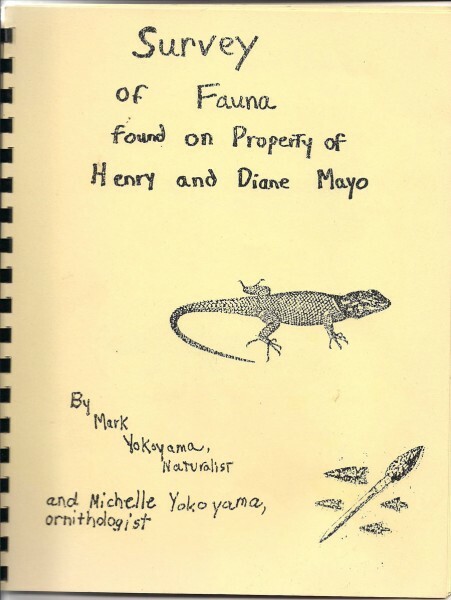 The author’s first wildlife guide, Survey of Fauna found on Property of Henry and Diane Mayo, was written almost thirty years ago, and describes a selection of fauna found at the author’s aunt and uncle’s house in Northern California. It is available in digital format for the first time ever. Download the pdf here.